NOTES: "Defender of the Grail" was created for "Crazy 4 Cult 2", a group show hosted by Gallery 1988, Scott Mosier, and Kevin Smith. The theme of the "Crazy 4 Cult" shows revolves around "cult" movies, of which, artists are invited to create a painting inpired by the "cult" or "b" movie of their choice. 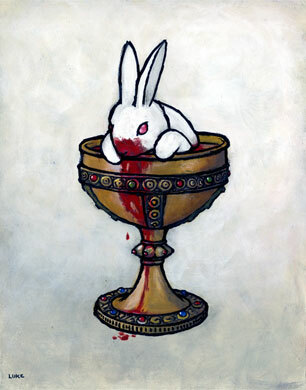 For "Crazy 4 Cult 2", I referenced the 1975 comedy classic "Monty Python and the Holy Grail". In "Holy Grail", King Arthur and his knights are practically descimated by a "beast" while searching for the Holy Grail. Coincidentally, the "beast" came in the form of an unassuming white rabbit.